Bar Pazzo is a relatively newer hot spot on the NEPA scene that I have been itching to get to for some time but busy schedules, some unique hours of operation, and a little one that doesn't necessarily appreciate "fine dining" had prevented me from getting there. Since they've opened, I've talked to many people who have been there and all have had really good things to say about it. Of course, the thing I was most excited to try was the wood-fired pizza. The stars all aligned on my birthday when the First Lady of NEPA Pizza told me to hop in the car and she surprised me with a trip to Pazzo. She told me that they don't accept reservations for small groups so we headed down for an early dinner. We didn't realize that they didn't open until 5:00 pm so we sat in the car for a bit checking out the really cool chandelier made from bottles from the outside. There is outdoor seating on the sidewalk which looked like a cool place to eat, but it started raining so we knew we wouldn't be dining outdoors. Five o'clock came and we eagerly went in to find a really classy and modern rustic looking interior. Our hostess took us to one of the really high-back booth tables which gave us an excellent view of the pizza area, which I was most excited about. The pizza area is super cool and included 2 wood-fired pizza ovens, a pizza counter, and is totally surrounded by glass and a counter with stools to get a bird's eye view of the action. It reminded me of a "pizza penalty box" for the hockey fans out there, but it was so much cooler than watching a guy missing a tooth banging his stick against the glass! Here we had pizza artists crafting classic Neopolitan pizza before our eyes. After geeking out observing the pizza area, and researching on the Bar Pazzo website that they use Antimo Caputo 00 Flour (which is the King of Pizza Flours) we ordered a Neopolitan pizza for starters. 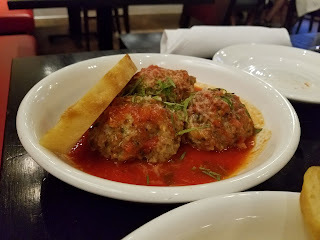 We had heard so much about the "polpetti" (meatballs) from our friends that we had to order them as well. For dinner, I went with the Ragu Alla Campania, which is essentially a souped-up bolognese and the first lady ordered a cavatelli in a pesto sauce with chicken. The entrees were both amazing, and the meatballs in particular were awesome. 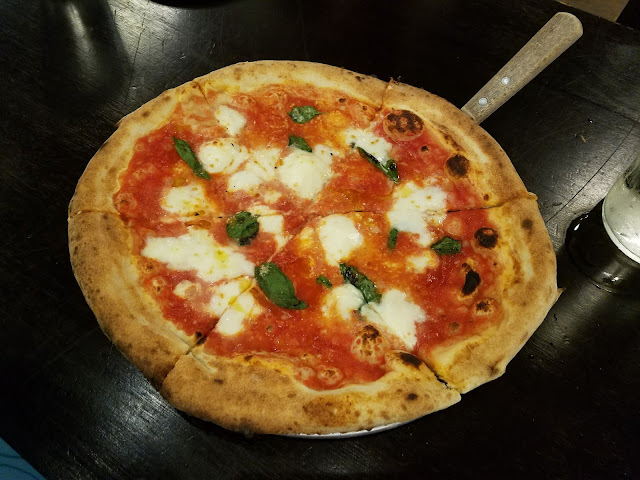 They have a hint of mint in them which gave them an interesting twist, depth of flavor, and a contrast that really works nicely with the san marzano tomato sauce. The pizza, which was ready in under 2 minutes came out looking very nice. The crust was a perfect golden brown with some, but minimal charring, which is exactly how we like it. 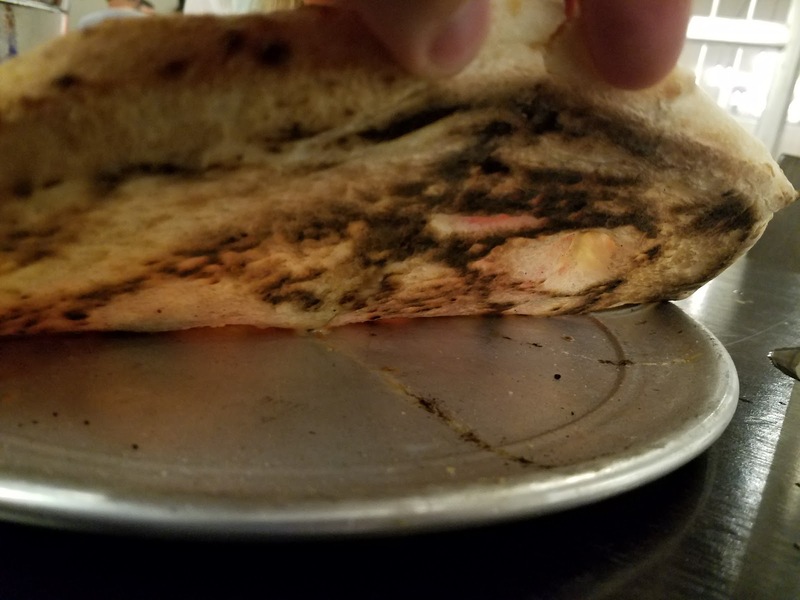 Sometimes a wood-fired pizza can take on too much smoky flavor if left in a few seconds too long, but this was perfectly cooked and added just the right amount of wood-fired taste. The sauce was bright, vibrant, yet simple and slightly sweet. 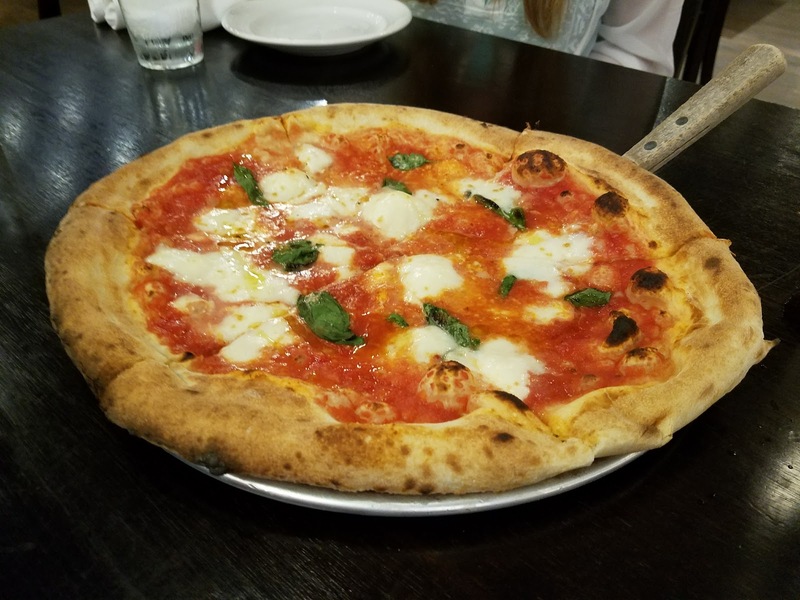 The fresh mozzarella cheese was sparingly applied and worked nicely to balance out the whole pie. 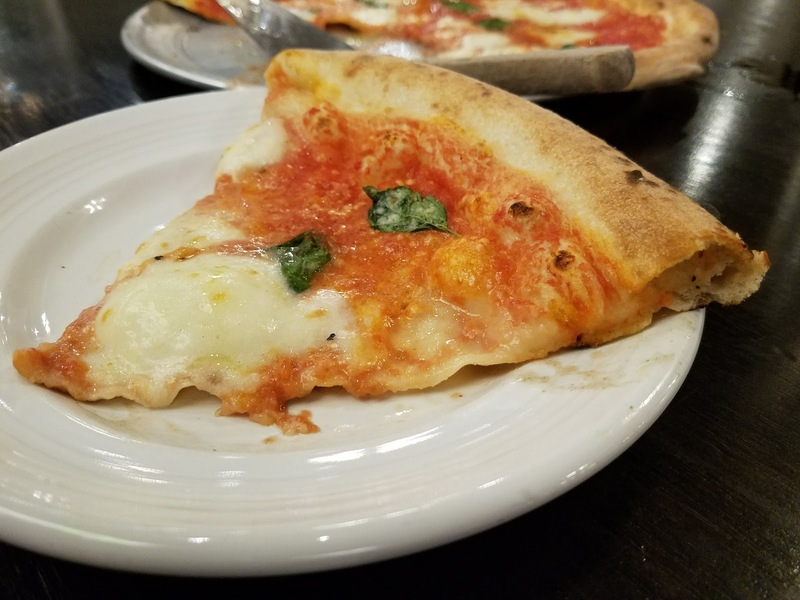 The fresh basil sprinkled on top gave the pizza the little edge of flavor that it needed. Overall, I thought this was a very good pizza. It was light on flavor, had a delicate and tender crust, and was a nice way to start our dinner at Pazzo. 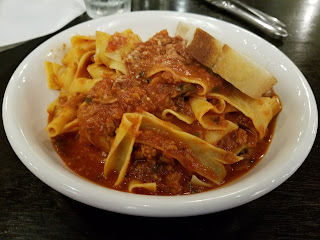 We really enjoyed our dining experience at Bar Pazzo, and somehow we already knew we would based on the rave reviews that all of our friends have given us. It's a great place to take a date (or a pizza dork on his birthday) and would make for a great lunch spot or even just to grab a glass of wine and an appetizer. The portions are on the medium/smallish side and the prices are a bit higher than many places, but well worth the price for a memorable meal, complex flavors, excellent service, an atmosphere that is second to none, and quality cuisine that is sure to satisfy. If you haven't been to Bar Pazzo yet, I highly recommend it to the NEPA Nation!